Model calibration is an important aspect in ship simulation. Here, ship motion is described by an ODE which includes tuning parameters that capture complex physical processes such as friction of the hull. In order for the simulations to be realistic for a wide range of scenarios these tuning parameters need to be calibrated to scale experiments. In principle, the optimal tuning parameters can be computed for any given scenario, but this would require a corresponding scale experiment to be conducted. The aim is to minimize the number of scenarios that need to be pre-calibrated while still being able to realistically model ship motion for a wide range of scenarios. In this paper we investigate the use of polynomial (sparse grid) interpolation to compute the optimal tuning parameters for any scenario from a few pre-calibrated optimal values. Perturbation analysis of a simple model for roll damping indicates that the optimal tuning parameter may indeed vary strongly with the chosen scenario. Numerical experiments with this model confirm that the optimal tuning parameters vary strongly (but smoothly!) with the scenario and can be well approximated with polynomial interpolants. Further numerical experiments with a more complex modelling code for ship maneuvring are very promising. van Daalen, E.F.G, Fehribach, J, van Leeuwen, T, Reinhardt, C, Schenkels, N, & Sheombarsing, R. (2014). 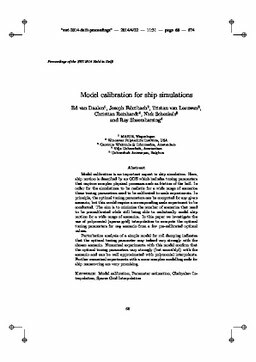 Model Calibration for Ship Simulations. In Proceedings of the European Study Group Science with Industry 2014.